Before you begin the search for the perfect chew toy, it’s important to understand the dangers that certain items can pose. Below are several guidelines to help you provide toys and chews that are going to be safer for your pet. Too hard – Very hard toys, such as antlers, dried bones, nyla bones or hooves, can easily break a dog’s teeth and should never be used. Bones are especially dangerous because they can break off or splinter, causing significant damage to the mouth, throat and intestinal tract. They also pose a choking hazard. A rule of thumb to follow is that you should be able to bend the object. Rawhides – Not all rawhide chews are the same. Look for those made only in the United States, as those from foreign countries often contain toxic chemicals used in the processing of the animal hides. Also, soften up the rawhide by soaking in warm/hot water for several minutes before giving to your pet. This helps prevent your pet’s teeth from being chipped on hard edges before the chew is softened by the chewing process. Monitor your pet closely, as even softened rawhide parts that are chewed off and swallowed can be indigestible. While some may move through the G.I. tract with no problem, others will not. Too soft – Very soft toys or toys that can easily be chewed into smaller pieces put animals at risk of choking or intestinal obstruction. Never give an aggressive chewer a soft toy or anything with a squeaker, as it can be ripped out and swallowed. Softer toys, especially those designed for cats, may also have tails or other small parts that can be chewed off and swallowed. Be sure to watch out for loose ribbon or strings, as they can become wrapped around a cat’s tongue. Too toxic – Human foods frequently contain artificial colors and flavors, but these chemicals have no place in chews or chew toys. Thousands of pets have also become sick from salmonella and other food-borne bacteria found in animal-based bone treats and rawhides originating from outside the United States. These products may also contain other chemical additives that would not be allowed in products made only in our country. Too small – If a chew toy can fit all the way inside your pet’s mouth, it’s too small. 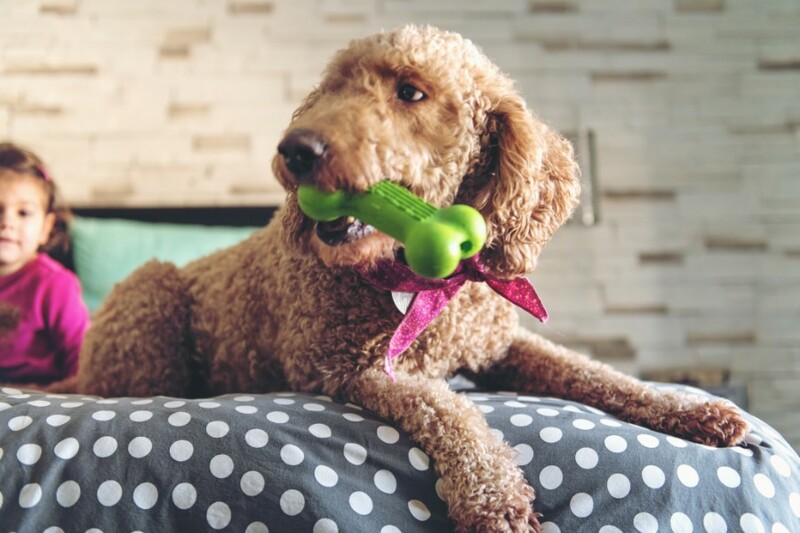 Finding the appropriate sized toy is necessary in order to prevent your pet from swallowing it (which poses a serious risk of choking or obstruction). Only one hole – Rubber toys with a hole only on one end, such as in a small ball, can cause a serious injury to your pet’s tongue. Without a hole on the opposite end, the tongue can become “suctioned” inside the ball, and remain stuck and swell. This, in turn, can cause permanent damage to the tongue and require surgery, (including the need to be amputated). Always be sure that if a ball has a hole on one end, that it has a similarly sized hole on the opposite end. Supervise your pet – Always supervise your pet while it is chewing or playing with a toy. It takes only a second for a part to break or tear off and be swallowed. It is a far too common problem, and we see many pets that end up with serious obstructions that require surgery to remove. The safest and most durable chew toys are usually made of hard rubber, do not contain toxic chemicals, and are made in the United States. Kong is well-known for such products and also makes sturdy plush toys for pets preferring something soft to play with. For rawhide chews, the same rule applies: The safest chews are made in the United States where the hide never leaves our country while being processed and made into chews. We usually carry a selection of these rawhide chews and Kong toys in our lobby retail store. The team at Lone Tree Veterinary Medical Center is happy to provide recommendations for safe, durable, and healthy chew toys. Remember, always supervise your pets anytime they’re chewing on or playing with a toy! Please don’t hesitate to contact us for more information. Next: Filling in the Blanks: Do Pets Get Cavities?